Honestly, I wasn’t entirely sure what I’d think of this film. From its initial trailer to be honest, I wasn’t too fussed about seeing it. This is probably because (unlike many, many people) I am not a massive fan of stereotypical spy films (I had yet to find out of course that this differed to the usual ‘Bond’ types), thus I thought it would probably be the type of film that I would watch if it was on television randomly. Before I praise it however, I’m going to state my annoyance of it. As always I’m fussy so I usually have something a tad negative to mention. Most people who have seen this would probably think the same thing and that of course is how annoying Samuel. L Jackson’s voice is within it. Now I love Samuel, don’t get me wrong (apart from that terrible film which is Snakes on a Plane and of course Deep Blue Sea), he is a fantastic classic actor but his voice is just so irritating (as well as the weird teenage clothes he seems to wear), which I guess adds to the comical element of the film. Another critical point is the fact that some of the action scenes are extended a bit too far in terms of length. Now this would appeal to many, but personally I think that sometimes less is more. Right, enough of the negative and on to the positive; I was surprised at how much I actually enjoyed Kingsman. With an amazing cast (including the great Michael Caine and Colin Firth), which led the plot brilliantly, it kept me entertained throughout. I also thoroughly enjoyed the quirky visual effects (for example, when they set the chip off and all of the ‘chosen’ people’s heads explode into what seems to be fireworks, accompanied by the British patriotic song ‘Land of Hope and Glory’) and when the SIM cards are activated and everyone around the world starts killing each other to the sounds of KC and The Sunshine Bands ‘Give It Up’. What I found comical about the SIM card scene is how initially it wouldn’t probably be the first choice for the background of the clip and yet somehow it works. The plot itself is also credible; with a number of twists and turns that aren’t for once predictable thus this itself conforms to a more original storyline than the types of films currently being released. 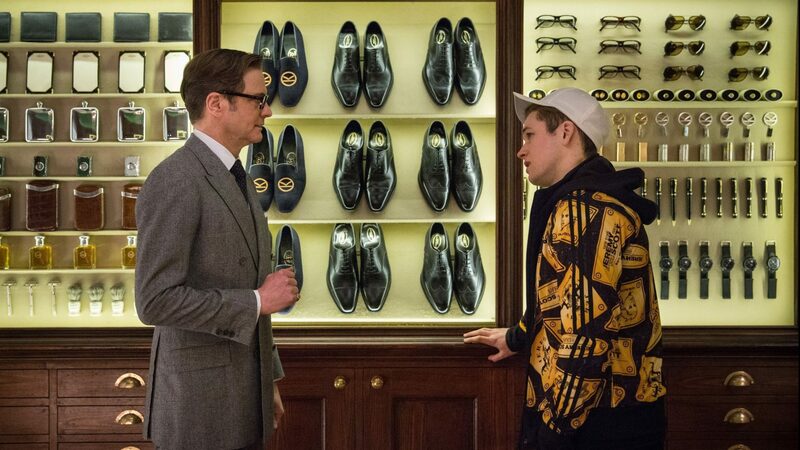 The film also has a number of comical scenes and expands across a number of different classes (not just the rich), which I guess in a way makes the everyday man feel a connection with the main lead ‘Eggsy’. Overall the film is definitely worth a watch, it covers a number of genres- from espionage itself to action, drama, comedy and adventure, and it is an entertaining piece of film that will keep you watching till the end.